To [man] it is granted to have whatever he chooses, to be whatever he wills. In natural magic nothing is more efficacious than the Hymns of Orpheus, if there be applied to them a suitable music, and disposition of soul, and the other circumstances known to the wise. Human vocation is a mystical vocation that has to be realized following a three stage way, which comprehends necessarily moral transformation, intellectual research and final perfection in the identity with the absolute reality. This paradigm is universal, because it can be retraced in every tradition. We have set thee at the world’s center that thou mayest from thence more easily observe whatever is in the world. We have made thee neither of heaven nor of earth, neither mortal nor immortal, so that with freedom of choice and with honor, as though the maker and molder of thyself, thou mayest fashion thyself in whatever shape thou shalt prefer. Thou shalt have the power to degenerate into the lower forms of life, which are brutish. Thou shalt have the power, out of thy soul’s judgment, to be reborn into the higher forms, which are divine. 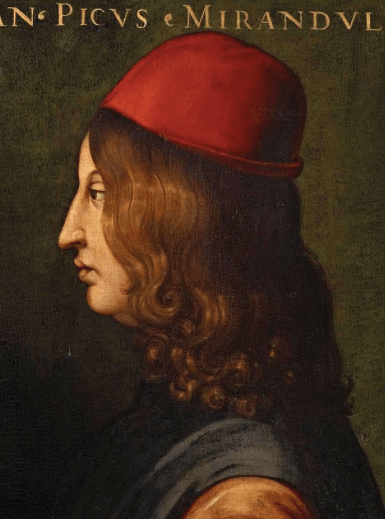 The third crucial innovator next to Plethon and Ficino was Giovanni Pico della Mirandola (1463–94). An intellectual prodigy, he created sensation in 1486 by inviting intellectuals from all over Europe to engage with him in public debate, presided over by the pope, about no less than 900 theses written by him. The theses reflected Pico’s wide-ranging familiarity with all the major traditions of learned speculation in philosophy, theology and science, including the ‘ancient wisdom’ and, most innovatingly, the Jewish kabbalah. But nothing ever came of the project. To Pico’s alarm and disappointment, Pope Innocent VIII responded by censoring 13 theses and eventually condemning all of them, with special emphasis on those ‘renovating the errors of pagan philosophers’ and those ‘cherishing the deceits of the Jews’. Pico’s ambition had been to demonstrate that all the conflicts between the different philosophical and theological schools, including the systems of Platonism and Aristotelianism, could be resolved in a grand harmony of universal wisdom and truth. His project culminated in the sensational claim that all the fundamental truths of Christianity were already contained not only in the various traditions of the pagan nations but, most surprisingly and controversially, in the secret tradition of kabbalah that God had revealed to Moses at Mount Sinai. As a result, the true Christian tradition would rule supreme: not only would the pagan sages be seen as bowing down symbolically before the truth of the gospel, but the Jews would have to convert quite literally, as it dawned on them that Jesus had been the true secret of their own ancient traditions all along. Pico’s grand debate never took place, and even his famous opening speech, later known as the ‘Oratio on the dignity of man’, was never published during his lifetime. 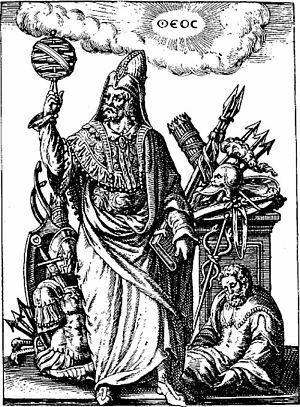 With prominent references to the Hermetic literature and emphasizing man’s unique freedom to choose his own destiny, it has been hailed as an ultimate statement of the Renaissance mentality. 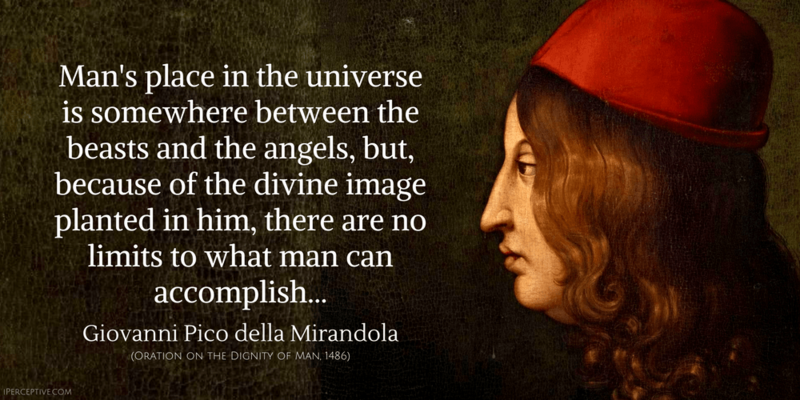 Giovanni Pico della Mirandola was a Italian Renaissance nobleman and philosopher. 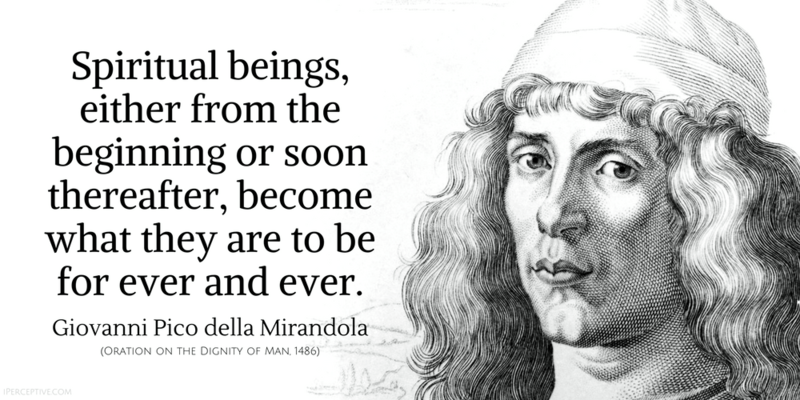 He is best known for a series of events in late 15th century, wherein he defended a number of theses on spirituality and natural philosophy.